Living on the fringe of both Whistler Village and the world of sports, disc golf is a unique game geared towards, umm, unique people. Let’s put it this way, when the nerdy feel sporty, they turn to disc golf. But I only use the word “nerd” in a purely affectionate way. I am after all, one of the converted nerds who has fallen in love with disc golf. The quirky game consists of throwing a specialized hard plastic disc (different from a light, soft Frisbee disc) through natural wilderness settings, with the goal of putting said disc into “holes” built of metal frames and chains (baskets), or from tall cylinders of aluminum (tones). Similar to its obsessive namesake, the sport can be as frustrating as it is fun. The good news is, it’s also free and a fantastic way to spend time outdoors away from the hustle and bustle of the Village. While it may seem silly to some, disc golf is actually a rapidly growing sport with a rabid following, its own governing body in British Columbia and World Championships competitions. Perhaps these are the reasons I thought the whole movement was beneath me. For years, I resisted friends’ invites to play, content to snicker at their quaint little nerd-fests from the sidelines. Plus, the one time I did try, it was really effin’ hard. Not being able to toss a child’s disc into a basket is hard on the ego…especially when you’re 26. Most towns now have a course, usually hidden away in the woods in order to stay free from fees and crowds. Whistler’s is unique in its Pacific Northwest DNA. The “Powerline” disc golf course rubs up against beautiful Lost Lake Park, and threads its way through coastal coniferous forests and rocky outcroppings. Whereas many courses rely on grassy parks as a canvas, Whistler’s is an art form built of the rugged and beautiful Coast Mountain topography. What else would you expect? The course is situated under and around the towering powerline towers that run North to South through Riverside RV Resort and Campground, which also happens to host the fantastic Junction Cafe for a breakfast or lunch stop at on your way to a match. To get to the course, follow the directions below, or ask the staff at Riverside how to get there. The course is segmented into three 9-hole sections, for a total of 27 holes to play. The first 9 are generally considered easier to play, the second 9 most-difficult (taking you up and down the hillside through steep rock and forests), and the third round moderately difficult. You can play all 27 holes (expect 2-4 hours to play a full round), or pick 9- or 18-hole sections for a quicker game (recommended for beginners and/or loved ones). Remember, half of the allure of disc golf is enjoying the outdoors, even if that time is spent searching for wayward discs. The other lesser-known Whistler course is located 10-kilometres south at the Whistler Olympic Park. Opened from 9am-4pm each day, the Callaghan Course, as it’s known, has 18 holes which follow some of the XC ski trails. While there are no baskets (which are preferred by most players), the course does have tones and some decent water hazards for more experienced players. The beautiful drive up the Callaghan Valley to get to the course might be worth it alone, and is a good option for families full of first timers. If I ever tried to teach my Dad disc golf, I’d go there. From the teepad of each hole (usually marked by a sign and a box built from wood), you throw or “drive” your first shot towards the metal “hole”. Most holes feature both a beginner and an advanced tee so if it’s your first time, try and find the closest tee to the target. It’ll make it easier on your arm. You can choose to throw the disc exactly like a traditional Frisbee, or you can throw it overhand, underhand, or any other way you need to put it in the basket. There are few rules, other than don’t wear a fanny pack, and use a proper disc (more on that later). Each hole on the Whistler course has a 3-par rating, despite the range of distance or difficulty, but don’t expect to get par your first time around. The game is more difficult than it seems. Purchase a proper disc (or 12, if you want to fit in with the hardcores) from Whistler Village Sports in Whistler Village. Ask the staff for help in picking a more diverse-playing beginner disc, as getting one suited to experienced players is bound to drive you nuts, pun intended. Other items you should consider bringing are sunscreen, bug spray (especially in the evening), water, and sturdy running or hiking shoes. The terrain can be rocky and you will be expected to do some hiking up and down unlevel ground. Don’t smoke on course (you’re in a forest, fool), pack out what you pack in (excluding the inevitable lost discs), and let faster groups play through (especially if that group includes me). Follow the highway north past Whistler village until you see a sign on your right that says “Spruce Grove”. Turn right at the lights then take an immediate left onto Mons Road. Drive past Riverside RV Resort and Campground and turn right. If you end up in the Sabre Rentals parking lot, you’ve gone too far. Follow the road up and over the Valley trail, where you will see a large open gravel lot. Drive to the far side of the lot and you will see a small pedestrian bridge over the river on the right hand side. Walk across the bridge and halfway up the hill. You will see a trail on your right marked with flagging tape. Follow the trail and it will take you to the teepad of the fourth hole. Welcome! 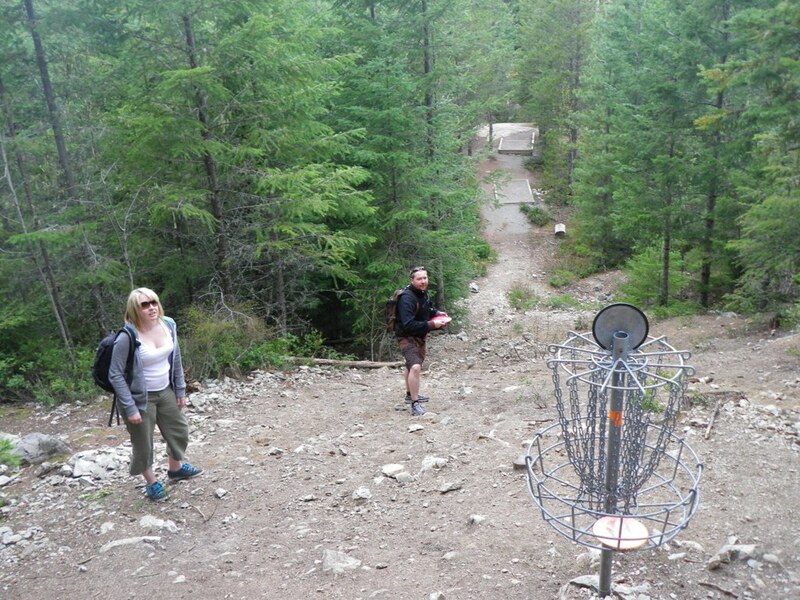 For more information, visit the Whistler Disc Golf Club website. To get an idea of the course, watch this video.